35” x 54” Fan-Shape Steel backboard has a 12 gauge steel shell with white powder-coat finish and printed target and border. Keyhole slots are positioned at 20’’ vertically by 35” horizontal centers for mounting. Has reinforced mounting points, including (2) safety mount holes which reduces vibration. Compatible Mounting: Ceiling and Wall Mounted systems, Gooseneck and Straight-Arm Posts. 5” x 4 1/2” Hole Spacing. 10 Year Limited Warranty. 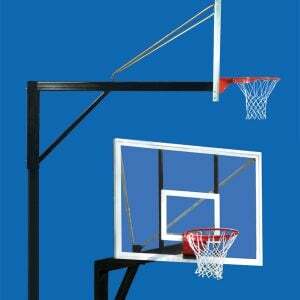 Please contact me with more information about: "Gooseneck 4.5 FST Basketball System".